Note: A foreign national can purchase a condominium unit under his/her name. 2.) Have the financial ability to make the payment for the property, whether in full or through financing. 3.) Be at least 18 years of age and able to conduct business with legal effects. 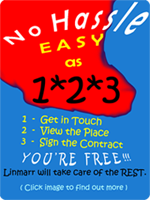 How to get in touch with Linmarr? 1.) Complete a Call Slip (PDF file). 2 valid IDs with picture and signature, preferably issued by a government agency, i.e. driver's license, passport, etc. All of the basic requirements above for both the company and the appointed representative(s). At the same time you will be required to pay the full contract price. If you have not already done so, the requirements to be attached herewith are the ones attached with the Customer Data Sheet and Option to Purchase Agreement form. At the same time you will be required to pay the downpayment. If you have not already done so, the requirements to be attached herewith are the ones attached with the Customer Data Sheet and option to Purchase Agreement form.